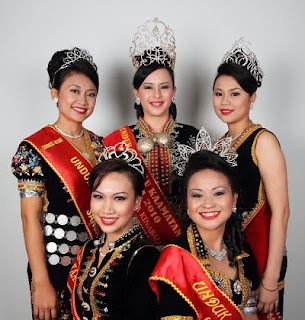 Kotobian Tadau Tagazo do Kaamatan 2010. Kopivosian! Izou ii Steve George mantad Putatan. 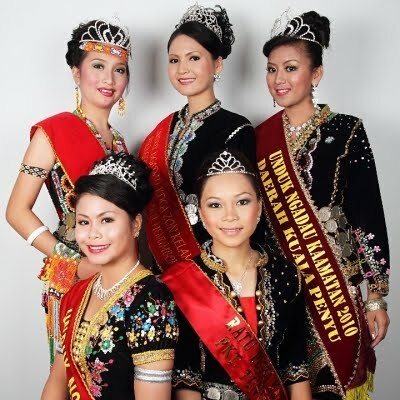 Maganu zou kosivatan diti do mamason Kotobian Tadau Tagazo do Kaamatan kumaa saviavi tompinai doid nombo nopo. It's 31st May and I'm here at this school doing my job as a teacher (doing my teaching practice). I've been receiving innumerable SMS-es from family and friends since last night - wishing me "Happy Kaamatan/Selamat Hari Kaamatan". Although I'm flattered to receive those wonderful greetings but the other side of me is dying to fly back to Sabah! The hall will definitely filled with people who came from all over Sabah. They come to support their respective Unduk Ngadaus. Somehow, the crowd will segregate themselves according to the districts. Speaking of Unduk Ngadau, I went online and found the pictures of the finalists of the state-level Unduk Ngadau competition for the year 2010. Usually I will leave the school at around 6.40 p.m.; after the routine assembly. However, yesterday, I had to stay a bit longer at the school because I was instructed to assist the discipline teacher to conduct a spot-check. Prior to that, one of the teachers in the school lost his mobile phone or to be exact, the phone was stolen. A student was named as the main suspect and was called to the staff room. As expected, the student refused to admit the offense and I can see tears glistening in his eyes. Let's just skip the Sherlock Holmes' part of the story. Basically, it's pointless to pinpoint several students to be the suspect. They will deny the accusation anyway. The thing is, why would you leave your valuable thing left unattended on the table in the staff room? Staff room is basically just like other rooms. Nothing special. So, never expect this thing will never happen in room full with teachers. Besides, the room is accessible to both students and even salesperson! Bottom line is: Don't leave any of your valuable things behind unattended! It's common sense. I was sitting at my desk in the staff room while surfing the Internet when Mr. Penyelia Petang approached me and handed me a tiny white slip. A request for relief again for two consecutive days. Without having the opportunity to say 'no' I took the slip and took a short glance at it. No surprise. I had to enter the same class again - Tingkatan Peralihan. Just so you know, that class is meant for students who came from both SRJK(T) and SRJK (C) schools. Meaning, it is prerequisite for them to enroll in the transition class to enable them to so-called get used to the different curriculum in the school. Well, basically I'm not going to do an explanation about the what tingkatan peralihan is all about. What caught my attention today was the sense of racism that seems to be ingrained in the students particularly the students in tingkatan peralihan. Everything went well in the beginning until the moment I asked them to form groups for an activity. I was quite shocked because at the very tender age they already have this thing called you-are-not-like-us-so-get-lost! within themselves. I noticed during the activity there's this one student who preferred to be alone and refused to join the rest. I approached this particular student and asked him, "Kenapa tak join yg lain?" Then the student said, "Diorang tak suka saya". "Sebab orang *****(race) itu tak suka orang ****(race) macam saya. Nanti gaduh." I was stunned for a while. Suddenly another students in the class said, "Sir, masa dah habis." I looked at my watch and realized the period was over. I took my stuff on the table and walked out of the class. My point here is, racism is not a thing that can be taken for granted. If racism is explicit at the early age of the children, it is often implicit and equally entrenched further - which is already obvious. It's been a tough and rough week for me personally. My other two friends might feel the same way as well. But, seriously. How would you react if a person brings nothing but a terrible stress and headache when A (let's just call that person A) is around you? I as well as my other 2 friends had enough stuff to handle in the school - from teaching and dealing with other things in the school. The first thing I desperately wanted to have as soon as I reached home is a good rest after a long tiring day and not dealing with that stupid moron with an attitude. I wouldn't want to endure such an innumerable stress! I would describe that person as coward, selfish, psychotic, irresponsible, dumb and...annoying! Ok. Gotta go. I had enough stress today. My weekend seemed to be wasted. Crap!! At the moment of doing this, I'm sitting at my desk in this stuffy staff room and I've just finished my lesson with the students in class form 2B. That was the only class for me today. Only 2 periods. I won't be describing my teaching and learning process in this entry as I wanted to share with you my experience prior the commencement of my teaching practice. Here it goes. On Sunday afternoon, the owner of the rented car (I am renting a car for 3 month as I do not have my own car here) handed over the car key to me. It was a humble Kancil. A tiny and old car. I was glad to have the car because I was able to move into the rented house. Another thing that bothered me was the fact that there were another 3 persons that were going to move their things into the house. Obviously, the tiny car couldn't fit all the things but fortunately Nad, at that time happened to be renting another car - a sedan - because she was driving her parents over to the airport. So, after that she drove back to campus and helped us shifting the things to the house in Banting. We were on our way to Banting when suddenly I realized the speedometer on the dashboard indicated I was driving at 60 km/h even though I was pretty much sure I was driving faster than that. The feeling of curiosity suddenly came. I knew something was amiss. Then moments later the car jerked and the temperature meter indicated that the car was overheating. I had to stop at the roadside, turned off the ignition, switched on the hazard light and opened the car's bonnet. Clouds of grey-ish smoke billowed from the engine. Felt bad for not checking the water level prior to the journey to Banting. We waited for the engine to cool down a bit and we opened the cap on top of the radiator and filled it up with water. Then, we continued our journey. The car didn't overheat but somehow the temperature meter was still indicating that the engine's temperature was slightly higher than usual. We went back again to UKM to get the remaining items (yes. two cars were not enough to move all the things in just one trip). I also went to fetch my other two friends as they wanted to go to the airport to catch the flight back to KK. Since, it was already dark and everybody was hungry, we stopped by at McD for dinner. To our horror, the sound of boiling water was heard coming from the engine as soon as we turned off the ignition. Crap! Why would that happened at that particular moment when I was extremely busy and I was few hours away from reporting for duty at the school. I didn't want to take a risk for driving the car for a long distance. Therefore, I decided to leave the car at Hentian Kajang and extended the rent for the other car; the one rented by Nad. So, we used that car to drive my friends to the airport and went back to Banting. I was not sure what was happening to me on that day. Perhaps, it was my unlucky day. My sandal was spoiled. The strap spoiled! Both Nad and I reached home at around 2 in the morning and we were damn exhausted. I was not able to recall the time but most probably I went to bed (err...mattress on the floor to be exact) at around 3 a.m. and woke up at 6 a.m. I only slept for about 3 hours and got myself ready to report for duty at school. When I was reporting myself for duty on Monday morning, the principal told me that I was assigned to teach in the afternoon session. So, the first day of practicum I spent the whole day at school from 7.30 a.m till 6.30 p.m! Exam was already over days before and I'm still here in campus preparing myself for the coming 'big-thing' - practicum. My practicum will officially start to commence on this coming Monday (3rd May 2010) and I'm having a mix of feelings about going to the school. A little bit nervous and excited at the same time. Nervous because it's going to be my first time to teach the students and this time around a supervisor and a mentor will be with me throughout the 3 months period serving as guidance for me. Excited because this is the time for me to immerse in a real environment - school environment - in which I will do all the things that a teacher usually does; from preparing lesson plans till attending teachers meetings and not to forget the core business - teaching. I just hope everything will run smoothly without much hindrance from the day I report myself for duty till the end of the practicum.